Artwork details: gouache, 10 x 8 inches (25 x 20 cm), 2004. She-devil taking a bath - painting in gouache. The first of the recent devil pictures was Coffee Break, where the She-devils are ordinary working girls enjoying a well-earned break after a long morning's persecuting the damned (well, it must be hard work!). Then there was Devil's Tea Party where the damned make an appearance as (in a cross between Hieronymus Bosch and Fetish art) the tables and chairs that the She-devils eat off and sit upon. You see, the devils do not even recognize them as people, they are merely part of the surrounding 'furniture' - part of the dull monotony of their daily job. Now, here's a little domestic scene - rather more fetish this time, but that's the background to this picture's development - it was a stage-by stage thing, and I doubt that I would have arrived simply at this point without going through the in-between stages. People often ask me how I think up my ideas - well if you can follow this line of reasoning you can understand the way my brain works. 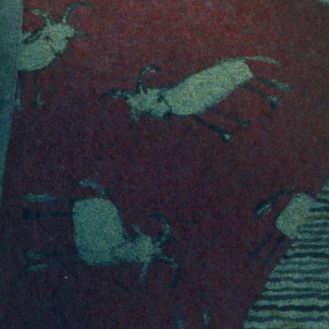 On a stylistic note, if you look at the highly magnified close-up above, you can just make out the goat-motif on the bathmat - Devils are highly predictable in their tastes in soft-furnishings.